Without a doubt the biggest area of lies. Almost every economist agrees that Brexit would be bad for the economy, as does the Bank of England, the IMF, and frankly everyone with any economic credibility at all. However, just being bad for the economy doesn’t say how bad it is. Perhaps we could tolerate a hit to the economy as long as it was a small hit, and was compensated for by other factors – e.g. higher employment. The truth is that no economist knows for sure exactly how much the economy will be hit. But some facts are that our EU membership fees cost us £13bn. We also get money back in the form of grants and so on, which are surprisingly hard to calculate, but best guesses are that we pay the EU £8bn a year. In comparison, the UK economy is about £1800bn. So our EU membership fees are about 0.4% of the economy. Economists are predicting a hit of anywhere between 0.1% and 9.5% if we leave, so it looks very likely that a vote to leave will leave the UK worse off financially. The Leave campaign have ignored all evidence on the economy and say that the £8bn we will save a year in EU membership will more than compensate for any drop in the economy. They could be right, but as noted it’s unlikely. More evil though, the Leave campaign has made a number of commitments to spending (e.g. we’ll continue to subsidise farmers), and those commitments add up to £113bn – nearly 15 times as much as the EU costs us. For example, Michael Gove said that we could use the savings in EU membership to give the NHS an extra £100m a week. Note the key word “Could” in that statement. An Evil reading of it is that we could, but the Tories won’t. And given that voting Leave isn’t in any way a vote for a party or a change of power, the Leave campaign actually have no authority or power to make any commitments whatsoever. Mwhahaha. The Remain campaign have also used the economic figures to their advantage. Yesterday George Osborne produced a sample post-leave budget with £30bn of tax rises. UK total tax income is about 30% of GDP, so this is equivalent to compensating for a 5.5% drop in the economy – slightly above the average estimates of economists. 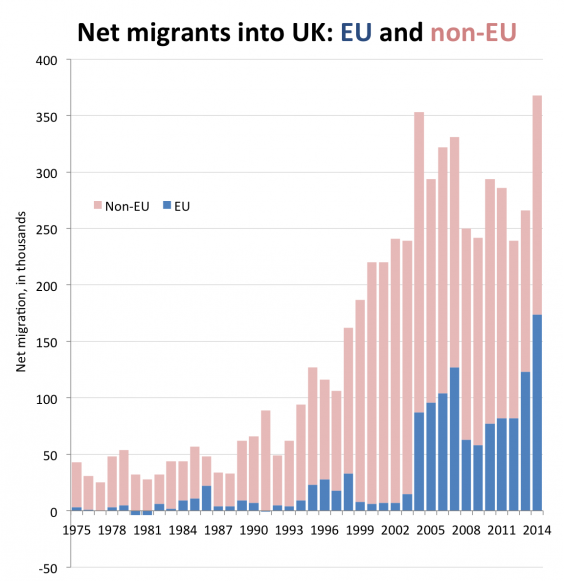 The UK has seen a large number of immigrants in recent years – over 350,000 last year alone. However, most of those immigrants are not from the EU, but rather are people that the Home Office reviews and decides to let in. And one reason for the EU immigration is that British people tend to not want to pick fruit or sell food to drunken people at 1am, and other EU citizens come here taking advantage of the job opportunities that we don’t want. But that’s inconvenient to admit when your whole narrative is about fear. The other inconvenient fact that Leave forget to mention is that freedom of movement with the EU is a condition of access to free trade that non-EU countries like Switzerland have imposed on them. If we want to leave the EU but still sell in Europe (the only way to minimize the inevitable economic hit), we’ll still have to let EU citizens come in, but won’t be part of the system the negotiates the conditions of that. Lastly, Leave complain that immigration has placed a strain on public services. That is true, but since most of the immigration is not EU, it might be fairer to say that the government has let lots of new taxpayers in to the country from all over the world, but has failed to provide sufficient public services to support them. Remain’s main stance on Immigration is that it boosts the economy. This is true, but the bigger question is who benefits from this boost in the economy. The answer is that it allows big business to employ more people for minimum wage, making lots of money for “wealth creators” like Philip Green and Mike Ashley, but has marginal effect on the average person.